Alas the moment we’ve all been waiting for - an easy recipe that is both delicious, filling, and environmentally friendly. I will keep the explanation short and very simple but as a Mexican who loves her cheesy nachos and smothered burritos and everything that’s creamy, I find that I usually have to make dishes that still have that cream factor without the actual dairy in it. Trying to go 100% plant based, I found that the toughest part was cheese for me - but if you find a good way to supplement it, its easy to say NAY SIR! 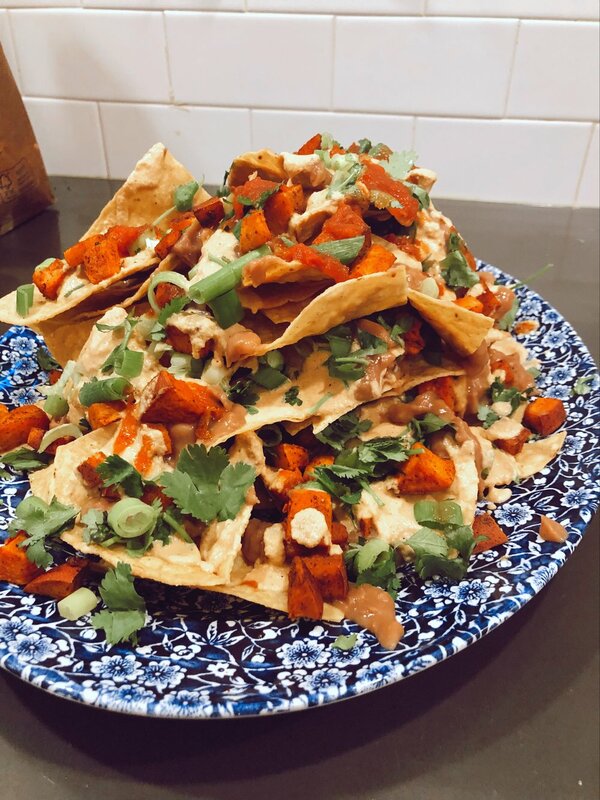 These nachos are plant based and all the ingredients can be sourced with low waste. ***Note : For the cashews for the nacho cheese - I soaked mine 3 hours before in hot water so its creamier in the blender but if you forget, its not a big deal - soaking them in hot water for even 10 minutes softens them up for a smoother consistency. 2. Dice up sweet potato in small cubes and put on a baking sheet with olive oil, salt, pepper, cumin, chile powder, and sweet paprika. Roast for 30 minutes or until soft and tender. When done roasting, take out and set aside. Turn oven off! 3. In a small sauce pan dump can of refried beans with 1/4 cup water in, stir and put on simmer. 4. In a blender, food processor, or immersion blender add the soaked/drained cashews with hot water, coconut milk, nutritional yeast, diced tomatoes, jalapeños, brine, carrot, juice of 1 small lime and a couple pinches of salt. Add salt and pepper to taste or any other ingredients you like. If you want it spicier add more jalapeños and if you want it sweeter add more diced tomatoes. Blend until really smooth and creamy! 5. Simmer nacho cheese on a sauce pan or dare I say it - microwave for 30 seconds to get it nice and warm! 6. Chop up cilantro and chives and…. ……GET READY TO PLATE THIS BEAST! 1. Add a base layer of chips onto a large plate and pour 1/3 of the refried beans, 1/3 of the nacho cheese, 1/3 of the sweet potatoes. 2. Add a second later of chips and do the EXACT SAME THING. 3. Add the third and final top layer with the rest of the beans, the nacho cheese, the sweet potatoes and then add the salsa, cilantro, and chives! Spritz with lime and enjoy!